Dad Jokes : Good, Clean Fun for All Ages! The perfect gift for Father's Day! "Dad, can you put my shoes on?" "No, I don't think they'll fit me." Ah, the dad joke--humor that reminds us of all the lovable, embarrassing dads out there. Be prepared for the obvious, silly, and awkward in this massive collection of the best groan-worthy dad jokes around, including clever quips, overly literal dialogue, and punny one-liners. I used to hate facial hair, but then it started growing on me. I'm reading a book about anti-gravity. It's impossible to put down! Q: What's the hardest thing about learning to ride a bicycle? 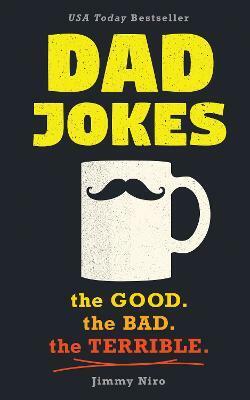 With over 500 knee-slappers, head-shakers, and groan-makers, Dad Jokes is packed with enough witty quips and cheesy-but-grate jokes for you to hold your own against even the most embarrassing of dads. But remember--you don't have to be a dad to tell dad jokes!